Environment Agency joins forces with partners to use natural features to capture silt run-off in the River Leven catchment. The Northumbria Rural Diffuse Pollution Prevention Partnership (NRDPP) started in 2014, focusing on improving agricultural practices. The project now involves the Environment Agency, Tees Rivers Trust, Forestry Commission, EGGER Forestry and numerous farmers. 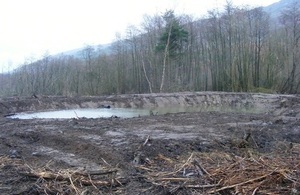 Last year, the partnership installed features such as large upstream silt traps and log dams in commercial forestry areas to improve the ecology of the watercourses in the River Leven catchment. The River Leven is a tributary of the River Tees in Teesside. The NRDPP project has resulted in some excellent interventions over the last few years. The Leven is currently failing Water Framework Directive assessment criteria due to silt linked to land management practices. Excessive silt in the water can smother fish eggs and impact on macroinvertebrate and aquatic plant populations. We are very pleased that EGGER Forestry and the Forestry Commission have joined us and the Tees Rivers Trust in partnership on the delivery of silt management in the Leven. This is the first time a private forestry firm has funded this type of work in the area and we look forward to seeing the beneficial results for wildlife and water quality in the catchment. Water management in operational forestry has become a major consideration when planning harvesting operations. Collaborating successfully with other interested parties on this project has provided us an opportunity to demonstrate our commitment to safeguarding the environment for future generations. Water quality in our rivers and streams is the best it’s been for more than 20 years and the Environment Agency continues to work closely with farmers, businesses and water companies to reduce pollution and improve water quality even further. England’s water bodies now achieve good or high status in 79% of the many elements measured under the Water Framework Directive and this continues to improve. The European legislation aims to improve the ecological and chemical status of waterbodies.